Comprising 9 granite islands covered in tropical jungle, washed by a clear blue tropical ocean and blessed with fine beaches, the Similan Islands are the most beautiful and diverse dive destination in Thailand. They lie in a 25 km long north-south chain, 65 km offshore from Phang Nga Province in the Andaman Sea, about 100 km from Phuket. 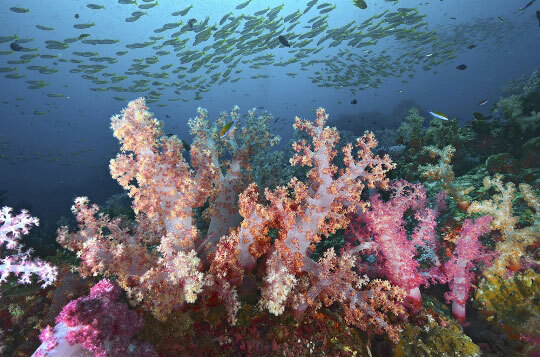 The Similans achieved national marine park status in 1982. Liveaboards to these islands are some of the most popular diving cruises in the world. The eastern fringes of the islands feature pretty hard coral gardens and sloping reef banks down to 30 metres. At some dive sites, large bommies (coral heads) rise from the sea bed and are blanketed with soft corals, fan corals, and swarms of smaller tropical fish. East coast Similan Islands diving is relatively easy-going, allowing you plenty of time to explore the sites at your own leisurely pace. 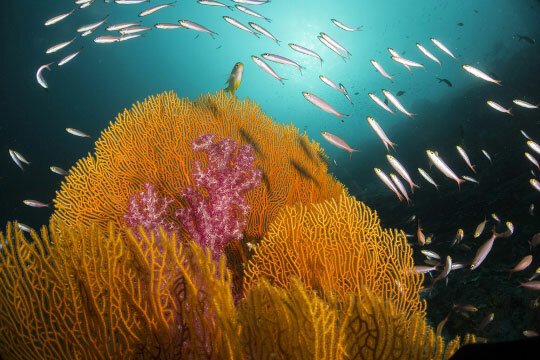 For underwater photographers and lovers of marine life, then scuba diving in the Similan Islands is difficult to surpass for the variety and abundance of tropical fish. Leopard sharks make appearances on a regular basis and you'll also see whitetip sharks. It's not a 'big fish' paradise, but it's consistently great for sheer diversity of marine life. You may find anything from tiny ghost pipefish to turtles and giant bumphead parrotfish. Although the tsunami of 2004 and more recent sea warming did affect a few of the reefs here, many are in good condition and some divers have commented that they could see hardly any reef damage. Liveaboard tours remain the best choice to dive at these islands. There are well over 25 different sites here, spread over quite a large area and far from the mainland. So, to truly experience all that they have to offer at a relaxed pace, we strongly recommend you choose a liveaboard. 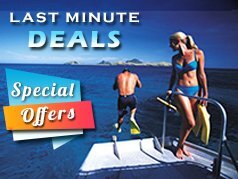 If you are short of time or prefer land based diving, then there are many day trips packages, with and without accommodation, to choose from. These options run from Khao Lak and Phuket. As a final alternative, there are a number of overnight trips that offer scuba diving opportunities at the Similan Islands. These operate with daily speedboats from the mainland that run you out to a main diving boat that you can sleep on. You can disembark whenever you like. These trips are cheap and very popular with budget travelers, but have constant disruptions for re-fueling and passenger transfers, and are therefore not always the most pleasant way to experience the islands. Anita's Reef is on the east coast of this small island, just off Similan Island No.4. The reef is a rather innocuous sandy slope with some spectacular coral bommies and patches, made up of table corals and staghorn corals. On the gentle slopes you can see lionfish and the reclusive and beautiful clown triggerfish and colourful Oriental sweetlips. There are several soft coral bommies, smothered in soft tree corals and sea fans, a good place to rest and watch the underwater sea life go about its daily cycles. 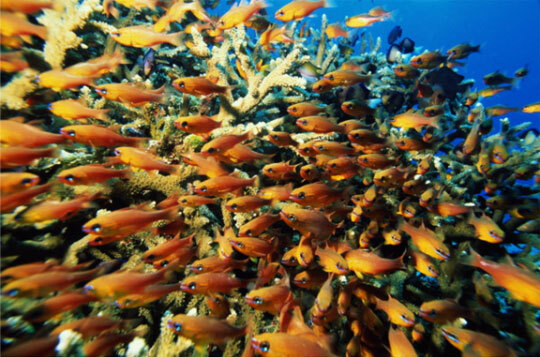 Large orange seafans host longnose hawkfish, and the golden brown and purple dendronephthya corals are used as sanctuaries for glassfish and juvenile fish. Stay here a few minutes and you'll see bluefin trevally hunting with incredible bursts of speed. Make your way slowly south across the sandy bottom and you're bound to see the fields of resident spotted garden eels. Often buried in the sand you can see blue-spotted Kuhl's stingrays. Watch out for the blue blanquillo, a type of tilefish, and the rather ugly and large greenish sea cucumbers. Shrimpgobies are very common in the Similan Islands, sharing their subterranean dwellings with snapping shrimps in a symbiotic relationship. The shrimp are short-sighted and rely on the goby to look out for danger, whereas the goby benefits from having a resident housekeeper. Sharp-eyed scuba divers can be lucky to find a whitepatch razorfish, and look out into the blue and maybe you'll catch sight of an impressive 2 metre fantail stingray swooping past. The scattered coral patches are made up of staghorn and bottlebrush corals, sheet corals, knobbly finger corals, with some larger coral species such as lobed and star coral. Slender grouper and Diana's hogfish hide out in the crevices. Common schooling residents are the delicate blue damsels and jewel fairy basslets, and blinding masses of slender fusiliers. Roundhead parrotfish and titan triggerfish tend to roam around, eating the hard coral, with yellowfin goatfish in attendance, guzzling up the resultant scraps. Boulders and large table corals dominate the landscape to the south where you'll find giant trevally hunting for easy lunch. Anita's Reef has large sandy patches and easy currents, that make it an ideal site for an early check-out dive. Beacon Point covers the most specific portion of Island no. 8 since diving starts at the extreme south of island. The main feature here are the huge boulders that rest from just a few metres below surface and go down to 30/33 meters. The boulders are covered with hard corals and gorgonian sea funs. Making your way east in the direction of Beacon Reef, the bottom drops to the 40 metre level and on the white sand you can see a multitude of Kuhl's stingrays. The rarely seen porcupine ray and other unusual rays can sometimes be found here too. Black tip reef sharks often swim around the boulders and look in the blue water for white tips too. Usually the water is very clear around the boulders. The diving normal continues north and parallel to the island on a submerged wall covered with hard coral, where the reef meets with the southern part of Beacon Reef. 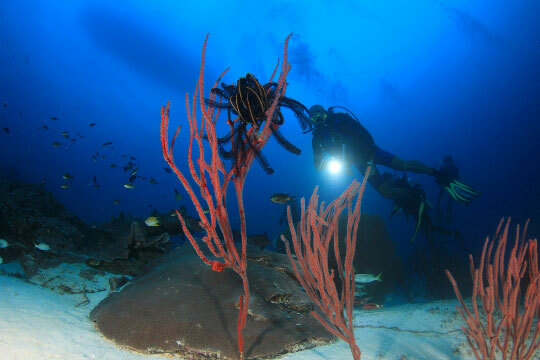 Down on the sand, divers can see the biggest gorgonian seafans in the Similans. This great coral is more than 2 meters wide. This is a submerged site about 1 kilometre off the east coast of island no. 3 and about 400 metres south east of Sharkfin Reef. Due to its exposed location it is possible to see almost anything on this diving site, including whale sharks and manta rays. If the current is running it is always an exceptional dive. As its name suggests, Boulder City is a large, submerged granite outcropping with jumbles of boulders lying scattered around a flat sandy bottom. The rock is so geometrically cracked in places that it resembles an enormous loaf of sliced bread. There is very little coral growth here except for branching green cup corals on the rock surfaces and golden gorgonian fans in the cracks and gullies. However, the algae growth here is substantial, meaning a prolific amount of grazers, including both nudibranchs and fish. The masses of unicornfish, butterflyfish and angelfish picking at the algae almost resembles cows grazing on the summer pasture. In the deeper sections, the landscape changes a little and red and white whip corals become dominant. Here you can see small schools of Oriental sweetlips, some large moray eels, blue-lined snapper, barracudas, triggerfishes and filefish. Leopard sharks are frequently seen in the outlying sandy areas as well as white-tip reef sharks. There are many cleaning stations here, and these provide a great opportunity to get close to slender unicornfish, a fish that is habitually very wary of divers. Some of the smaller species that divers can see are jawfish (endemic species to the Similan Islands), purple and red fire gobies. This is one of the more advanced dives at the islands as there is no area of the site shallower than 10 metres. This means that Boulder City requires a little more careful planning than most sites in the Similans. It's a good idea to end your dive at the shallowest boulder outcrop in the centre of the site so that you don't expose yourself unnecessarily to the strong currents that can sometimes run here. There's often schools of yellow-dash and neon fusiliers in this area, as well as black damsels. This site derives its name from the beautiful early morning light here at Koh Bangru (Island No. 9), and the easy paced nature of this reef means it's an obvious choice for a check-out dive at the beginning of your diving cruise, and there are lots of sergeant majors darting around making it an ideal site for snorkellers too. The reef slope drops to 18 metres and is home to angelfish and milkfish, then steep banks descend further to 34 metres where you can see black-spot garden eels and occasionally Napoleon wrasse. In the shallows, leopard sharks are seen resting in the sand and often octopus and moray eels may be found lurking in the vicinity. Turtles and banded seas snakes are are regular visitors here too. At the southern most point of the dive the reef gives way to large boulder formations lying in deeper water. There are few corals here, but due to the stronger currents in this more exposed area, there is a good chance to see cobia, chevron barracuda and larger tuna species that frequent the Similan Islands in search of food. The rocks form several small swim-throughs and channels where you may be lucky to find resting white-tip reef sharks. This site is named after the jumble of granite boulders stretching out from the southern point of Similan Island No. 4. The boulders drop down to 27m and their crevices are home to large giant moray eels and refuges for bumphead unicornfish. The eels are often being groomed by cleaner shrimps. The shrimps' claws pick off bits of algae, loose flesh and parasites; an act as much like doctoring as grooming. To the west of the wall are coral gardens rising to 12m. In the shallows further to the west are more boulders forming crazy overhangs, swim-throughs, tunnels and caves. If you're lucky, you'll get to see the 2 metres long resident group of white tip reef sharks lurking in their hideouts. In the shallows you'll find parrotfish, soldierfish, and surgeonfish. Keep an eye out too for sweetlips and trumpetfish as these are also numerous here. Also known as Bird Rock, Chinese Wall is one of Similans best kept diving secrets. One of the most colourful, scenic and often exciting dives in the islands, a visit to Christmas Point usually begins by dropping in close to an exposed rock on the far west side of Similan Island 9. This boulder is the start of a long rocky finger that works its way down to the sandy bottom at 30 metres depth. This outcropping is home to several giant archways which provide superb underwater scenery and form some of the best swim-throughs in the Similans. The rock walls are highlighted by radiant soft corals and the sea fans can be very large, and there's a chance of sighting a white-tip reef shark or two hunting out by the deep boulders. Napoleon wrasse often cruise over the rocks and a large school of chevron barracuda can regularly be found hanging out at about 15 metres depth. Cruising all around the site you may find schools of trevally constantly darting in and out of the blankets of small fry that cover the boulders, and from time to time manta rays can be spotted gliding past in the blue. Look in the rubble areas for things like ribbon eels and fire gobies, and check the sand plains beyond the arches for white tip or leopard sharks. A "must see" dive site on your liveaboard trip. Located on the north side of the small Similan Island No. 5, Coral Reef lies in an east - west direction. Your dive will start at a point furthest north, away from the island in deeper water. Descend to the bottom at 29 metres and you're sure to disturb a particularly well camouflaged Kuhl's stingray or two, resting and half buried in the sandy flats. Winding your way slowly south via several coral patches and white whip coral beds, you've a chance to see white-tip sharks that frequent the reef's outer edges. Also here are small schools of ever-inquisitive longfin batfish. As you work shallower the reef becomes more established with some examples of solid table corals, lobed pore corals and yellow pore corals, covered in hundreds of blue and orange christmas tree worms. Fish common here include black and white snapper, yellowhead snapper, longnose emporer and occasionally a stalking and sleek great barracuda. Safety stops at Coral Reef can be eventful too, as the reef is shallow enough for you to pass the time searching under ledges for the numerous and sometimes very large giant moray eels. These mean-looking but mainly harmless creatures, often yellow or green and brown, can grow up to almost 3 metres long. Similan Island No. 6 - Koh Payu, this is another deep dive forming a 'V'-shaped ridge on the north side of the island. The 'V' points north into deep water and the sides of the 'V' form the reef slopes of the site. The best section of the site is located to the north and close to the cracked and exposed rock that marks the dive site. Descend down the buoy line here to 10 metres or so and there are several impressive swim-throughs. The best plan is to stay fairly close to this area by circling out to the north to a depth of 25 metres or so, where there are purple and green soft corals; going deeper when the current runs north is pointless and fairly difficult as it can be a strenuous exercise to get back again. If you enjoy pelagic action, and your luck is in, this is a great scuba spot to just hang out and watch to story unfold. Many types of fusilier gather here to feed, and this of course attracts hunting fish such as schools of rainbow runners, bluefin trevally and giant trevally. Just watch the fusiliers scatter in a frenzy when dogtooth tuna approach! Around the mooring point the coral life is quite nice, with some small table and wart finger corals, and plenty of leather corals. Boxfish, the beautiful powderblue surgeonfish, feeding on the rock surfaces, and lyretail grouper are easy to spot here. 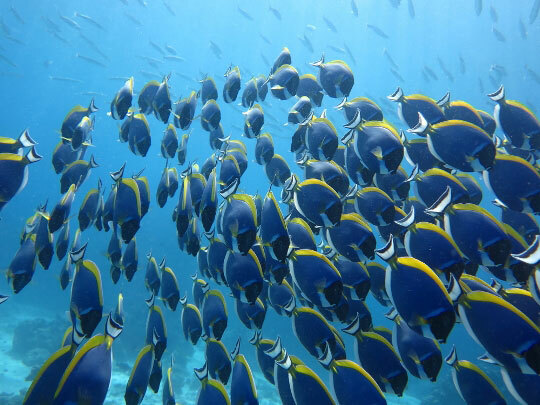 Chocolate butterflyfish, bannerfish and Java rabbitfish are common schooling residents. If you dive deeper then lots of blue-spotted sting rays, white tip reef sharks and leopard sharks can be found; all common sightings at the Similans. Deep Six was badly damaged during the Indian Ocean tsunami on 26 December 2004 that swept through the Similan Islands. There are still some examples of the tsunami's devastating effects with upturned table corals, uprooted fans, dead gorgonian exoskeletons, as well as considerable swathes of barren rubble slope where once stood coral reef. Easily the most recognisable and photographed landmark in the Similans, Donald Duck Bay is named after a rock on the north side of the bay that resembles the cartoon character - not the most prominent large boulder that balances precariously at a seemingly impossible angle, but another rock in front and slightly further out of the bay. Island No. 8 has a national park camping area and Donald Duck Bay on the north west corner is the most popular mooring spot for day trippers and liveaboards alike. Consequently, a lot of food makes its way into the bay and so the molluscs, gastropods, crustaceans, and cephalopods are particularly well fed and large-sized here. This makes for fascinating night diving. Scurrying across the rubble bottom are huge bull crabs, red octopus and cuttlefish, all hunting for scraps and tasty morsels. The most interesting section of the dive site are the boulders running out of the bay on the northern edge. 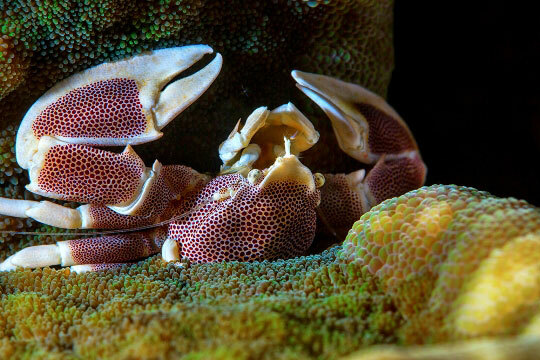 These form several swim-throughs, and house emporer shrimps, red round crabs, decorator crabs, triton shells and cone shells. Donald Duck Bay also has several friendly, large green turtles and you are more than likely to come across them even on a night dive. Unfortunately, they have developed a taste for bananas and one wonders how long it will be before they swallow something else that will not sit so well on their stomachs. Please, when you are on a boat trip in the Similan Islands, do not throw anything overboard or try to feed the fish with leftover food. Please note that, due to extensive damage caused by coral bleaching, East of Eden has been closed to all dive operators since 2011. Located on the southeast coast of Island No. 6 (Koh Payu), this dive site has the most incredible bommie in the Similan Islands. Just to the south of the main reef and from a depth of 21 metres up to 12 metres, the concentration of marine life is unequalled in the Similans. The main body is covered in a breathtaking array of blue and purple soft corals, lobophyton soft corals, and red bulb tentacle anemones hosting skunk anemone fish and western clownfish. Small groups of redtail butterflyfish, checkered snapper and yellow boxfish are ever-present. The lower reaches of the bommie have green sea fans and overhangs full of yellow soft corals. It's a good idea to bring a torch on this dive site as dory snapper and black snapper lurk here in the shadows, as well as the incredibly beautiful but reclusive regal angelfish. Pairs of longnose butterflyfish go about their endless feeding, unperturbed by prying eyes. Circling round on to the upper section the marine life is rich and diverse with a good chance to find a frogfish or other odd critters. Underwater photographers may spend half a dive on this bommie alone! Elsewhere on the reef you'll drift gently along the lower reaches, spellbound by the magnificent maroon and golden gorgonian sea fans, some larger than yourself! The topography at the bottom of the reef is quite varied with many rock and small bommie formations, used by peacock groupers and large schools of blue-striped snappers and yellow goatfish. Starting your ascent, you'll move over huge bankings of brown and sky blue-fringed sheet corals (Echinopora lamellosa), stacked from 10 metres all the way down to 25 metres. Bluegreen pullers fly delicately around, yellow damsels and Indian triggerfish are common residents here. Yellowback and neon fusiliers often shoot past, typically in trains of a few hundred, and sometimes tuna arrive, on the hunt for tasty morsels. As you come shallower still, any current that was present tends to die down and the dominant life forms change to table corals and stubbly finger corals with their resident brown and cream spiny-tailed puller damselfish and humbugs. The sandy shallows are interspersed with patches of blue corals, red elkhorn and fire corals. Octopus can be seen foraging through the coral rubble and 3-spot dascyllus are often nearby. Juvenile dascyllus display the 3 white spots for which this species is known, but as they mature the spots fade until they become jet black adults. The abundant fish and coral life here makes East of Eden a popular choice for Thailand liveaboards. The site is named after an unusually shaped rock (Hin Pusa) that juts out of the water just southwest of Koh Similan. The huge boulders that form Elephant Head Rock create daring swim-throughs, arches, caverns, gullies and tunnels. Follow the steep channel down through the big boulders to gain access to the entrance to the swim-throughs. At the top of the channel on the dominant boulder is a small orange/yellow sea fan. Take a look on its fronds and you'll find a colony of spiders crabs, and close-by are large black egg cowries. Watch out for cuttlefish and mantis shrimps as you descend further down to entrance floor. Swimming through the tunnels you'll come across blue-ringed angelfish, Andaman sweetlips and bicolour parrotfish. Yellow goatfish and snappers always hang around at the deepest levels, as well as several species of lionfish, grouper, and the occasional olive Ridley's turtle or hawksbill turtle. Take a look under the overhanging ledges to find several species of the larger snappers, such as one-spot, mangrove and black and white, as well as giant sweetlips. Down at 30 metres on the sand you can look for purple fire gobies and the rare McCosker's dwarf wrasse. If you are lucky you may spot a leopard shark or a whitetip reef shark. A little shallower is the endemic Similan jawfish. Back towards the centre boulder pinnacle, giant trevally dart past, performing their daring mating manoeuvres. Mating couples sport different colours, one being typically silver, the other jet black. Hang out in the shallows here to off-gas at the end of your dive. Powder blue surgeonfish make their way across the boulder tops, grazing on the algae. Bigeye bream hang out here, seemingly eying you curiously, as large trains of travelling robust fusiliers arrive on the scene from other nearby feeding stations. Fantasy Reef is a great spot to enjoy the grandeur of underwater boulder formations that cover this huge area. Located on the west coast of Island No. 8 - Koh Similan, the friendliest fish in the islands hang out here, including clown trigger fish, normally a difficult fish to approach, and cowtail rays in the sand. Please note that Fantasy Reef has been closed to all liveaboard diving charters since 1999. Located off the southern point of island no. 5, Hideaway is sometimes known as Barracuda Point. The complete Similan site which shows, at a glance, the different topographies that dominate the local seascape. Starting out in the deeper water to the south of the dive site, you'll find some very spartan, isolated sunken boulders on the sandy sea bed. Not much breaks the feeling of isolation here save for a few dark green branching cup corals, clinging grimly to the boulder surfaces, and the occassional burst of action as a blue-spot stingray sparks into life as it is disturbed and darts away. Most of the colour available here is provided by the solitary clown triggerfish, exploring the rocks. To the north is a section of shallower reef dominated by mozaic and star brain corals and lobed pore corals. These dome colonies provide secluded homes to small families of common lionfish. Orangespine unicornfish and powderblue surgeonfish graze on the coral surfaces. Red fire gobies can often be seen hovering just above the sand. Knobbly wart corals are obscured by reticulated damselfish swarming around its fingers, black pyramid butterflyfish flit elongantly through the shallows. In 2005 the Similan National Park built a small memorial at Hideaway for the Indian Ocean tsunami. They are set in about 10m depth of water, just at the section where the flat sand starts to slope down. There also 2 small mermaid statues in the same area which are often used for night dives. The northern tip of the Similan archipelago, North Point is just east of Christmas Point on Island No. 9 and offers similar conditions off its north coast - huge boulder formations that cover a wide area. Normally buoys are available to descend, and the boulders are lying on 35 metres and rise to 10 metres, forming swim-throughs and gullies between the rocks. Hard and soft corals both grow between the boulders, sheltered from the current that can be strong. At the base of these stones you can find ribbon eels and mantis shrimps. Jacks, surgeonfish and fusiliers are in great numbers here. When the visibility is good, look into the blue and above for a big shoal of chevron barracuda that patrol North Point. In the shallows closer to Island 9, between 8 and 14 metres, there are enormous flat plains of cauliflower leaf corals and stubbly finger corals. Covering as much area as you can here, you're bound to run into green turtles and black and white banded sea snakes. Further north you can see a white sand valley with a depth around the 40 metre that connects North Point to North Point Pinnacle. If visibility is good and currents are gentle, you can start diving from the pinnacle - a huge boulder off the northern part of Similan Island 9. The pinnacle starts around the 24 metres deep and goes down to over 50 metres. Take a look down and you will possibly see sharks resting after the night, sometimes also manta rays are spotted here. Check you air and deco time often, there is no ascent line here so the way home is south to the North Point formation. Fly over the white sand valley, looking for leopard sharks that rest on the sand or swim in the morning from deep water to the north point sands. Under normal conditions after 5 minutes you can see the shape of the North Point rock formations. If you air consumption is good then you can make it to the reef, or to one of the lines tied on top of the boulders for your safety stop and ascent. When visibility is over 20 metres and there is no current, this dive site offers stunning underwater scenery. Running from Island No. 3 and extending all the way to Boulder City, this long ridge normally exhibits good visibility and provides dramatic and contrasting scenery to those dive sites found on the easterly sides of the Similan Islands. It's really a series of massive granite boulders covered in gorgonian seafans and a variety of hard corals. The northeast features a sloping reef of stacked boulders, the southeast a more prominent drop-off reminiscent of an underwater Grand Canyon. There's a large swim-through that provides an opening to the other side of the site. The swim-through should be taken with caution due to the delicate hard coral growth. 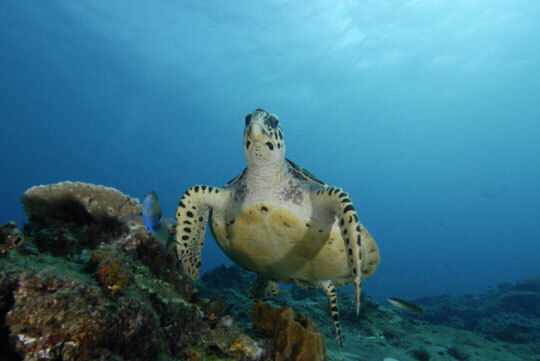 The marine life is more diverse there with Napoleon wrasse, turtles, large cube boxfish, clown triggerfish, schools of batfish, yellow goatfish, palette surgeonfish, blue-faced angelfish and bannerfish. It's also a good place to spot passing sharks and larger rays. Usually done as one of the final dives of a liveaboard trip to the Similans so watch your no-decompression time here. Stonehenge is at the northern end of Princess Bay, on the northern side of Koh Miang (Similan Island No. 4). The site consists of a chain of large towering granite boulders, stretching from the island into the depths of the Andaman Sea. The large alleys that the rocks form host gorgonian sea fans and barrel sponges. Scuba divers who explore the area will find common lionfish and bearded scorpionfish. The area is frequented by barracuda, tuna, trevally as well as being home to long-nose butterflyfish, yellowtail wrasse, angelfish and yellow or black and red ornate ghost pipefish, swaying motionless in the branches of the orange sea fans. 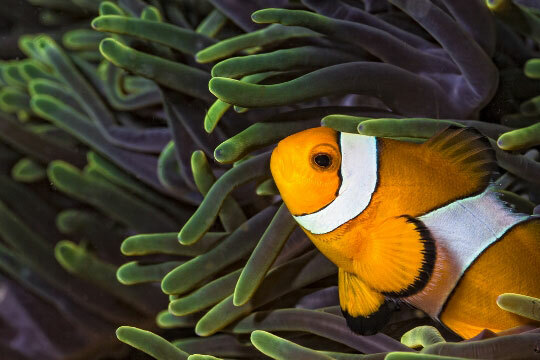 Clownfish and anemonefish busy themselves restlessly in the tentacles of their host anemones. Elaborately patterned clown triggerfish, yellow boxfish and several large giant morays provide great photo opportunities and there is a chance of spotting unusual large rays such as blotched fantails or Jenkins' ... if you're lucky. On the north east corner of Island No. 9, Koh Bangru, Three Trees has fantastic diversity but is somehow overlooked on most Similan liveaboard trips and therefore is one of the more pleasurable experiences here. There are expansive reef flats and gently sloping beds of hard corals. There are some of the largest table corals you are ever likely to see, staghorn corals, hibiscus corals, branching and encrusting fire corals, and massive lobed leather corals, as well as white wire corals. Sometimes swimming high above the reef in open water and at other times resting in slots in the pore corals, you'll find red-toothed triggerfish, surprisingly named after their front teeth colouration and not their splendid blue bodies. Watch for blackbelt hogfish hiding out under the table corals. Adults have red heads and yellow tails, their rather shy juveniles have dark brown bodies with splendid bright yellow spots. Other fish common to this dive site are raccoon butterflyfish, Meyer's butterflyfish, humphead unicornfish, Oriental sweetlips and bigeye. Big fish that you may see here include brown marbled grouper and impressive-sized blue yellowtail emporers. Thailand's last few Napoleon wrasse can sometimes be found here too. These magnificent creatures have been shamefully hunted into near total obscurity in the Similan Islands for Chinese fish market demands, just like in most places in the world. 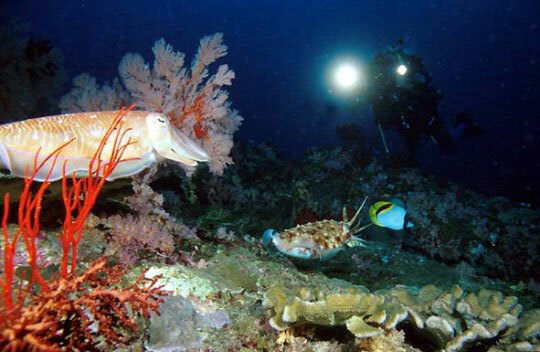 Breaking the splendour of the reef are several large boulders at the deepest section of the dive. Here are often resting leopard sharks, some huge greenish sea cucumbers (stichopus variegatus), up to ½m long, and nesting green triggerfish. The boulders are decorated by gorgonian and knotted sea fans and these in turn host cleaner and multibar pipefish - strange red and white striped creatures. Many nudibranchs including chromodoris geminus (magnificent sea slug) also make this Similan site their home. As if that were not enough even for the most hard-to-please divers, this site happens to have more than its fair share of cleaning stations too. Often you'll see fish such as dogtooth tuna and chevron barracuda with mouths agape, posing in the most compromising of positions. West of Eden, also known as West of Six, is located at the north-west corner of Similan Island number 6. It has something to offer scuba divers of all levels. While some of the most visited dive sites in the past may have suffered shallow reef deterioration, West of Eden enjoys healthy hard coral reef coverage in the shallows which are alive with various colourful tropical fish species. There is also amazing granite boulder topography around which to dive and admire the abundance of gorgonian sea fans, acropora table corals and soft corals that thrive here. 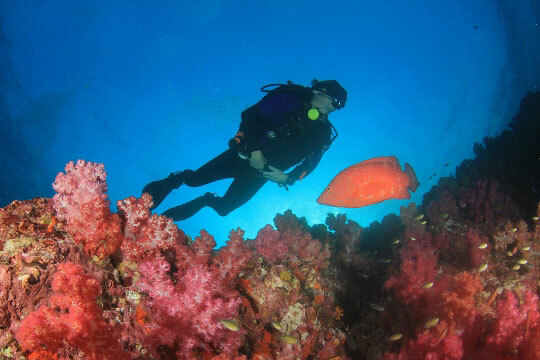 It is little wonder West of Eden has become a firm favourite among visiting scuba divers. The dive usually starts a short distance from the island's northernmost point dropping down in a small sheltered bay. Visibility is generally good here so you can wander along the reef looking for batfish and turtles which are frequently spotted here. 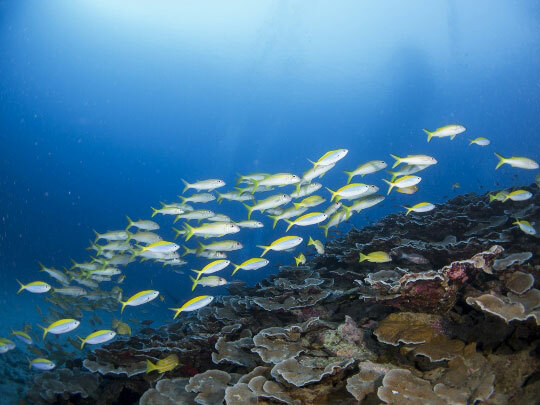 Some of the best parts of this site are in the shallow areas where several large schools of yellow goatfish hang above the corals, whilst trevallies provide plenty of action as they blitz across the reef hunting glassfish. Common reef octopus can also regularly be seen on the top of the coral, changing colour as you approach. For the less experienced visitors to the Similans, the tops of the shallow boulders provide great visual reference whilst the more advanced divers can find their way through the rocky channels and down the outside of the boulders. Here are the deepest parts of the dive where you can find frogfish and ribbon eels, which are very unusual in this area. Other interesting sights include giant morays being cleaned by white-banded cleaner shrimp and, from time to time, a large blotched fantail ray can be found under the crack in the rocks. With all this activity in the deeper areas it well worth diving on nitrox to extend your bottom time. Heading back up to the shallows, you can look for tiger cowries and the occasional ghost pipefish before completing your safety stop with one of the resident great barracuda or turtles which regularly surface near the dive boats looking for food. West of Eden can have the occasional cold current which also increases the chances of some of the bigger fish passing by on the outside of the reef, so be sure to keep an eye out into the blue during your dive. Dive The World Thailand Recommendations: Christmas Point, Elephant Head Rock and Three Trees. Scuba day tours, overnight trips and longer liveaboard cruises to the Similan Islands run from November through to May, although May can sometimes see adverse conditions and cancelled trips. Outside of these months, surface swells can adversely affect conditions. Visibility is usually between 25 and 40m during this period and, in the absence of monsoon winds, the seas remain calm. Water temperatures hover within the 26 to 29°C range, with February to May enjoying the warmer end of the scale. The end of February also often sees an increase in currents attracting the larger marine creatures like whale sharks and manta rays. From May to August, the weather is often better in the Gulf of Thailand, so you might consider day trip diving from Koh Samui, although local diving around Phuket and Phi Phi continues year round too. In the Similans, the dive sites are closed for these few months, allowing fish to spawn and the reef to recover from the tourist traffic.